However, we have three problem areas–the finished basement, the kitchen, and our bedroom. 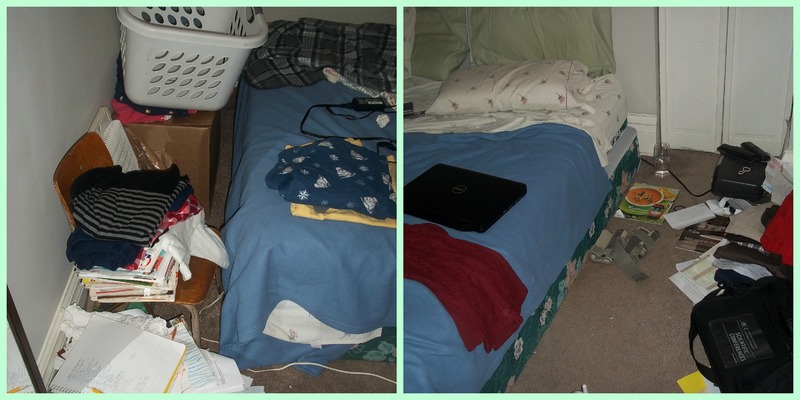 We took the tiny bedroom, which is about 10′ x 9′, so when it’s cluttered, the clutter overwhelms the room. It’s amazing how much more peaceful and relaxing the space feels. Now, the next two big places to tackle our the kitchen (our central headquarters for clutter, it seems) and our disastrous basement. For now, though, I’m happy to get this one room done. I should be able to work in here much easier this weekend! I shared this post at Money Saving Mom. We actually have a frame for it, but we don’t use it because my husband likes it better on the floor. Go figure! Good job! It’s funny how there seem to be certain places in the house that attract clutter….for me it’s the garage – yikes! It looks so much more restful. Great work! I did our bathroom and the entry closet this morning and it’s great to start the weekend with a clean house isnt it? Yes! I can’t believe how much better the bedroom feels now. Yes, it’s always the last. It feels great now though! Great job! Looks like you got a lot accomplished. Yes, a less cluttered space is more relaxing!